OK, I dont expect the Superhawk to win this battle, but I have one and I love it. I also love trackdays as I just did my first two at Thunderbolt NJMP and I'm fukin hooked. I want a strictly track bike and I have 3 options. #1 Get some Sharkskinz Race bodywork and track the hawk. I've had my Hawk for 6 years and it's much better than when I first got it (Penske shock, Racetech fork springs/valves, Cbr600f4i front calipers/mc, vesrahs, factory shift kit, Staintune cans, K&N filter w/Factory jetting, APE CCTs, De-paired), but I wonder if I'd be better off with a bike designed for the track. 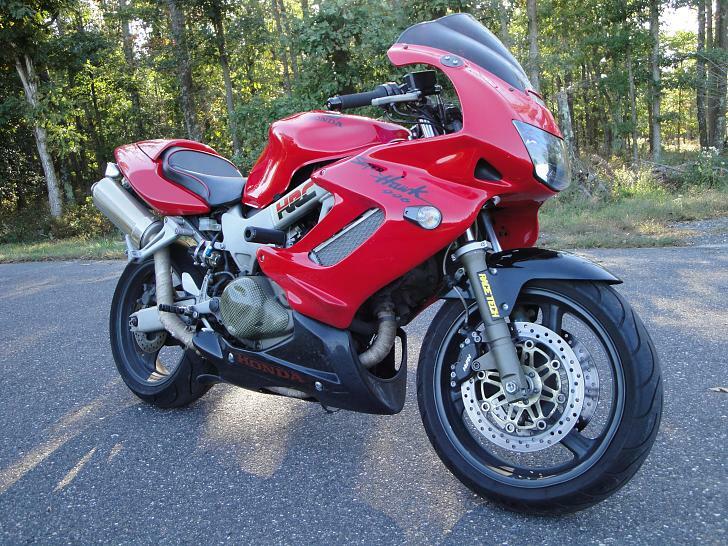 Which brings me to #2 A guy I work wit has an '05 CBR600RR w/ 4,900 miles for $3,200. I think thats to good of a deal to walk away from, but one of my favorite things on the track was just blasting out of the turns with my hawk. I don't know if the faster corner speed could beat the exit speed I get from the Hawk. #3 Theres a few good deals on RC-51s in my area. 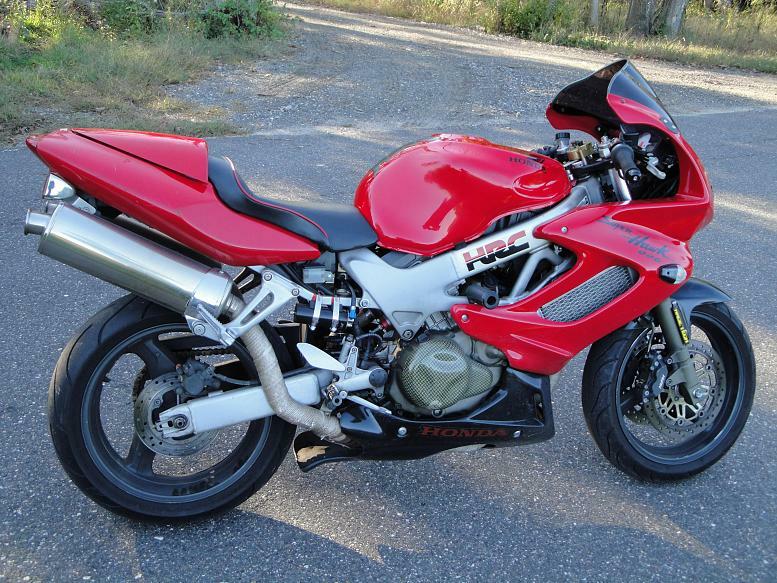 The RC51 has that torque I love and handles better than a Hawk in stock form, but is it nessecary. I mean I can afford one of these bikes, but am I going to have that much of a better track experience on either one to justify the purchase. 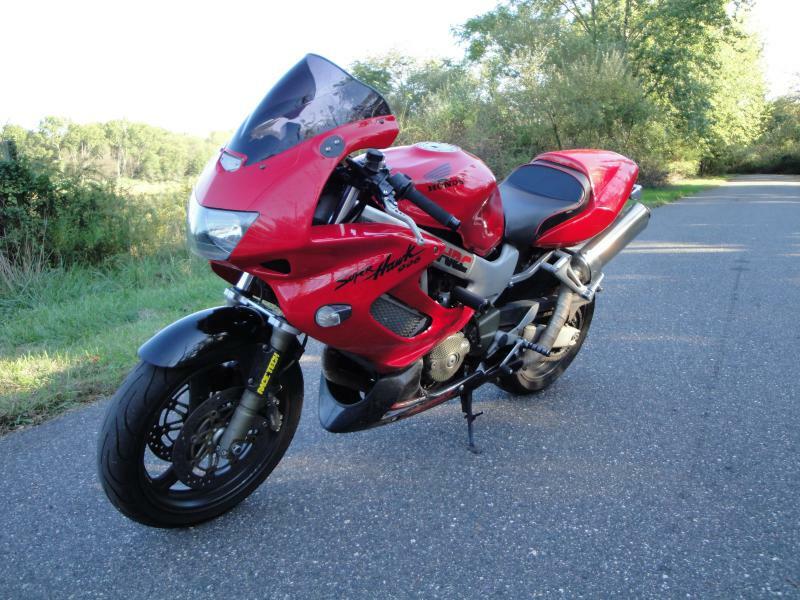 The Superhawk is my first and only sportbike so any one with experience on either a 600 or Rc-51 I would appriciate some input to help me make the right choice. My track goals are purely enjoyment. I don't plan on ever racing, just having fun in a safe envirnment. Well, I haven't ridden an RC, but I have ridden a few 600cc supersports and I've tracked my hawk. If I were you, I'd track the hawk. 1. The frame geometry is the same as an SV650, which are renowned for being good beginner track bikes, and there isn't much difference between how the superhawk and a 600 turn as far as effort goes. I've been told by a few people that the RC takes more effort to turn, and it's super stable when it's leaned over. 2. 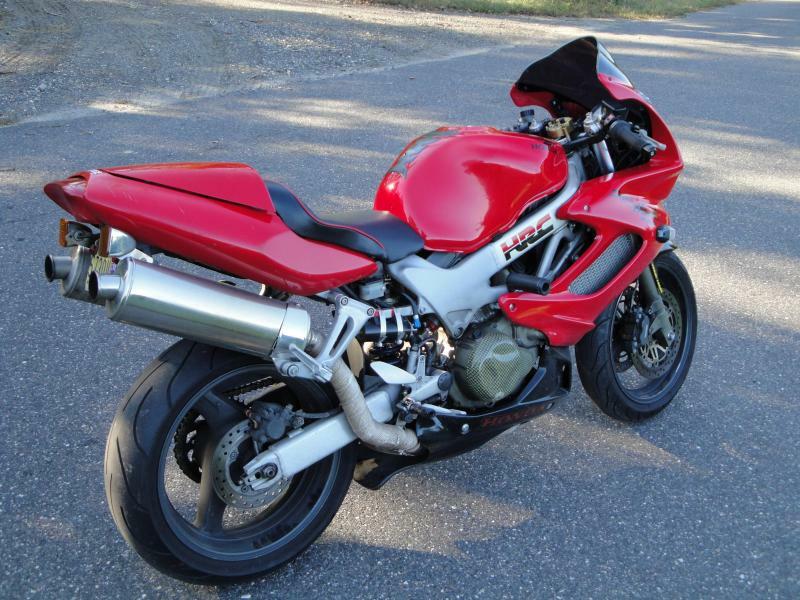 The crummy resale value of the VTR can play in your favor if you wad the VTR up. It's a lot easier to crash a bike that isn't worth a whole lot, and I'm not trying to say anything bad about your bike. It's just less financial risk. It would be a shame to wad up a nice RC or a 600 and be out 5k bucks. Good advice: don't track a bike you're not willing to bring home in a ball. 3. You already have the most important stuff done to your hawk to make it track worthy. 4. If you're after enjoyment, why not ride the bike that you know you already enjoy. 5. The RC will be hell on tires. They're heavy with lots of power. The 600 not so much, it'll be light on tire wear. 6. You won't have a better track experience on those bikes compared to the hawk. The hawk is a blast to ride fast. The motor is easier to use than the 600, and it's easier to turn than the RC. I really had a blast on the Hawk at the track and the only complaint I had was the brakes just didn't feel like they wanted to stop the bike. Well that was before the f4i upgrade with Vesrah pads. I just finished that this week and that is one hell of an upgrade. Bike stops on a dime. I think I'm stickin with the Hawk. A set of race plastics and maybe some rearsets and it's done...... for now! Don't know if it sold on ebay though. How about some pics of this proposed track Hawk? I second Tweety, the CBR is going to feel lighter in corners, not tire you out as much and if you have the extra funds to run a track bike I would go with it. I've been trying to convince the wife to let me get a 600 track bike for months now, no luck yet but I think I am breaking her down! Your Hawk is way too nice to put on the track. I've got the same situation as you in that I've put a lot into it and it is such a great street-sport bike that I can't imagine throwing it down on a track... as much as I'd love to get it out there. You want my advise? Got to the WERA forum(great source for used race bikes) and find a track-***** Ninja EX500 for $1500 then go flog the crap out of it. One day you MAY even get to the point where you can ride that bike to its limit. What is this and should it be capped like the other side?